LP: Your latest book ‘The Good Steward: The Ernest C. Manning Story’ published by Fifth House (Fitzhenry & Whiteside) is just out. Can you summarize your subject? 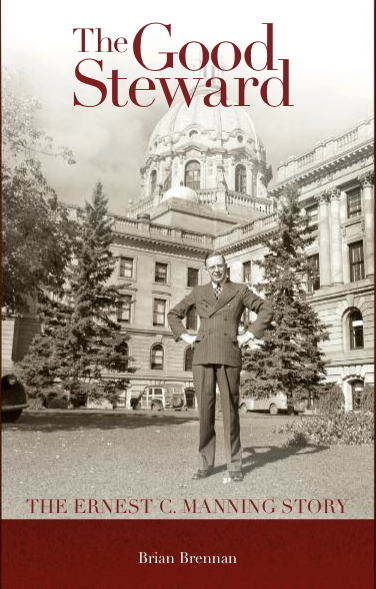 BB: The book is about a Saskatchewan farmer’s son who came to Calgary as a teenager in the 1920s to become a Bible preacher and ended up combining his calling as a radio evangelist with a successful political career that saw him become Alberta’s longest-serving premier. LP: Writing about provincial characters can be frustrating at times as it can be tricky attracting readers from other parts of the country. Why should the rest of Canada care about Manning? BB: He did have a national profile as director of the Back to the Bible program, which ran on radio stations from coast to cost for more than 50 years. He also served in the Senate for thirteen years after leaving provincial politics, so that gave him a national profile as well. But beyond these appearances on the national stage, Manning as Alberta’s Social Credit premier was a key figure in promoting the first commercial development in the Athabasca oilsands. Because of the international attention now focussed on the oilsands — with environmentalists accusing the companies of producing “dirty oil” — I think readers might be interested in finding out how the development all got started. They might also be interested in learning how the energy policies developed by the Manning administration in the 1940s and 1950s helped transform Alberta from a have-not province into an economic powerhouse. And, during this current period of economic turmoil, I imagine readers would be interested in knowing how Manning restructured Alberta’s post-Depression provincial debt at a time when this province had zero credibility in the North American investment community. LP: Is Manning a sympathetic character? BB: Easier to admire and to respect than to like, I would say. That’s not to suggest, however, that Manning was unlikeable. It’s just that for many people he was essentially unknowable. Even his son Preston characterizes the relationship as “distant but harmonious.” Manning was a very private individual who allowed few outsiders to get close to him. LP: What was the biggest surprise for you when researching Manning’s life? BB: That, unworried about the possible environmental consequences, he once seriously toyed with the idea of detonating a nuclear bomb in the oilsands. Happily for those concerned about the potential danger of nuclear fallout, this bizarre plan never came to fruition. With countries around the world imposing bans on underground nuclear testing, Prime Minister Diefenbaker intervened in 1959 and unilaterally cancelled the oilsands experiment. But Manning still thought it was a great idea. LP: Ernest Manning is the father of Preston Manning, founder of the Reform Party. What influence did the father have on the son? BB: All of Preston’s ideas about Senate reform (the so-called Triple-E initiative) came from his father, who decided after a short time in the Red Chamber that the institution either needed to be changed or abolished. Preston’s ideas for tempering conservative principles with the social conscience of prairie populism also came from his father. LP: The Calgary offices of your publisher Fifth House were recently closed and operations moved to the offices of the parent company Fitzhenry & Whiteside. Did this move have any effect on you? BB: Only to the extent that I am now working with a publicist in Toronto rather than one in Calgary because Fitzhenry & Whiteside has centralized that part of its operations. I’m still in regular touch with Charlene Dobmeier, who steps down as Fifth House publisher in November but will continue to work in Calgary for Fitz & Whit as acquisitions editor and project manager for the Fifth House imprint. Whenever I have a book idea to pitch in the future, I’ll be talking to Charlene first. LP: You’ve got an autobiography, or at least part of an autobiography out now as well, as one of the contributors to ‘The Story That Brought Me Here: To Alberta From Everywhere’ published by Brindle and Glass. What differences are there for a writer writing biography as opposed to autobiography, aside from the obvious such as personal memories? BB: As an autobiographer, you’re constantly asking yourself how much you should reveal. If you give away too much, will your words end up hurting those you love? That’s rarely an issue for me as a biographer, because most of what I write is taken from public records, on-the-record interviews, and so on. Telling tales about one’s family and friends, though, is a different matter. It could, potentially, border on invasion of privacy. LP: You’re from Ireland originally and have written a biography of Irish poet Mary O’Leary. Who was O’Leary and why did you want to write about her? BB: She was my maternal grandmother’s great-grandmother, so in the first instance I did the book as an exercise in family history. I was intrigued by the fact that we had this famous 19th century Gaelic-speaking folk poet in the family, and I wanted to bring her achievements to the attention of an English-speaking readership. LP: Do you follow contemporary Irish writing at all? BB: To a very limited extent. I tend to be drawn more toward subject matter than to the fact that the book has been written by a particular author. If the subject interests me (I have a bias toward memoir and biography, as you’ve probably noticed), I usually make a point of ordering the book. LP: Any favourite Irish writers? BB: Nuala O’Faolain, Roddy Doyle, Frank McCourt, Edna O’Brien, Peter Sheridan, Clare Boylan, Patrick McCabe. I was also impressed by the audacity of a young unknown named Jamie O’Neill when he came out in 2001 with a blockbuster novel, At Swim, Two Boys, inspired by the comic writing of the late great Flann O’Brien. But O’Neill turned out to be just a one-hit wonder, so he’s no longer on my reading list. LP: You’re a musician, a pianist. How does one career (writing/playing music) influence the other? Any plans to write about music/musicians or are the two arts separate for you? BB: The words have to come together in a certain way, according to a certain rhythm, before they seem right for me on the page. That’s how the music influences my writing. Paradoxically, when it comes to playing songs, I am more interested in chord structures and melody than in lyrics. Then I care more about the sound of the music than about what the words are saying. I have written biographical profiles of musicians in some of my books, but haven’t given the full-length treatment to one yet. Perhaps in the future. I like writing about musicians because I have a feeling for what they do. LP: All of your books have been non-fiction. Any desire to write fiction? BB: I did take a stab at writing a semi-autobiographical novel a couple of years ago, but it wasn’t very good. I sent the manuscript off to a couple of publishers, who did the right thing by rejecting it. I wasn’t offended by this. I realized that after working as a journalist for more than 30 years, I can do non-fiction better than I will ever be able to do fiction. So, a full-length non-fiction autobiography is now taking the place of the fictional one. LP: Will you continue to write about people from Alberta’s past or are you looking elsewhere for future material? BB: Aside from the current autobiographical project, I likely will continue to write about Albertans as long as I live in Calgary, for the simple, practical reason that I can do the research without having to spend long periods away from home. If I ever move to Halifax — not that I have any plans to do so — I guess I’ll start writing about Nova Scotians.